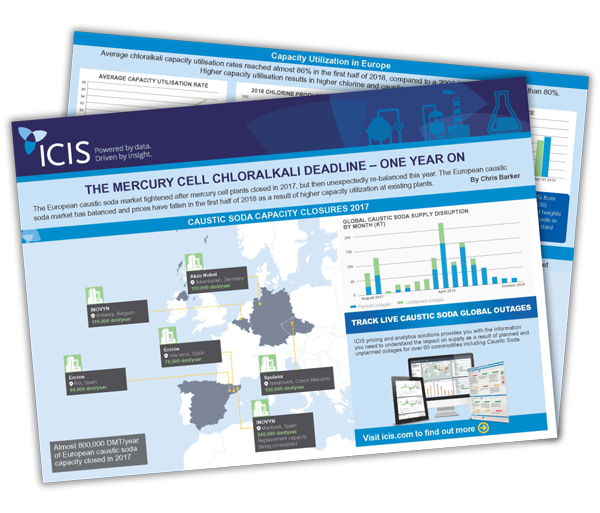 Almost a year ago, the last mercury cell caustic soda and chlorine plants in Europe were closed. As we approach the anniversary of the 2017 phasing-out deadline, a review of the market shows the ways in which the chemical industry has adjusted to the change. Higher utilization of existing capacity has helped to re-balance Europe following the tightness last year. Download more ICIS infographics displaying global production capacities, trade flows and more, for a range of commodities including Propylene, Ethylene, MMA and PE.